I love living here. 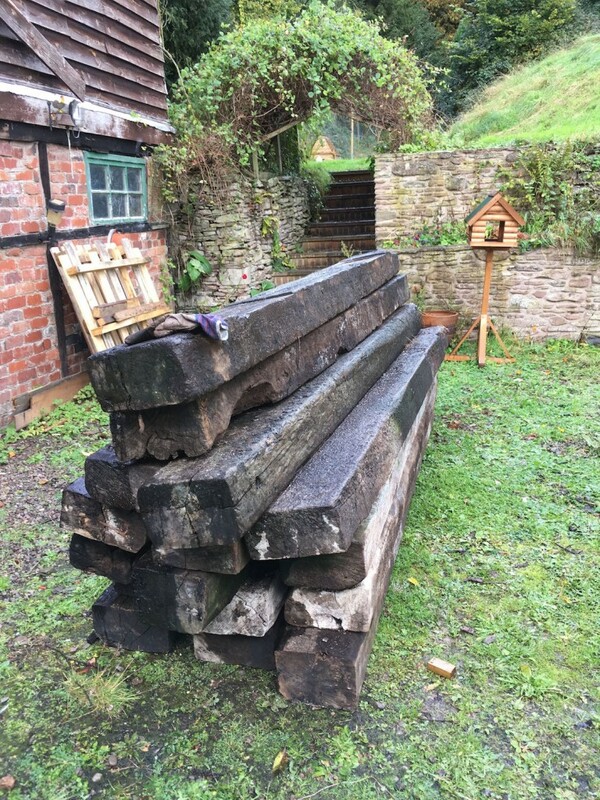 The Sunday before last, we were in the pub having a pint, and I mentioned I was looking for railway sleepers to make raised vegetable beds. Farmer Leddy asked how many I wanted, and how long. Not too filthy, and all ready to move up the hill. Except they’re about 100kg each. Joe and I moved two of ’em, then decided it was a bit lairy. Slippery hill and potential broken legs and all that. It would have been okay if it was just moving them around on the flat. So, last Saturday night, we were in the pub. Again. Three drunken farmer lads. 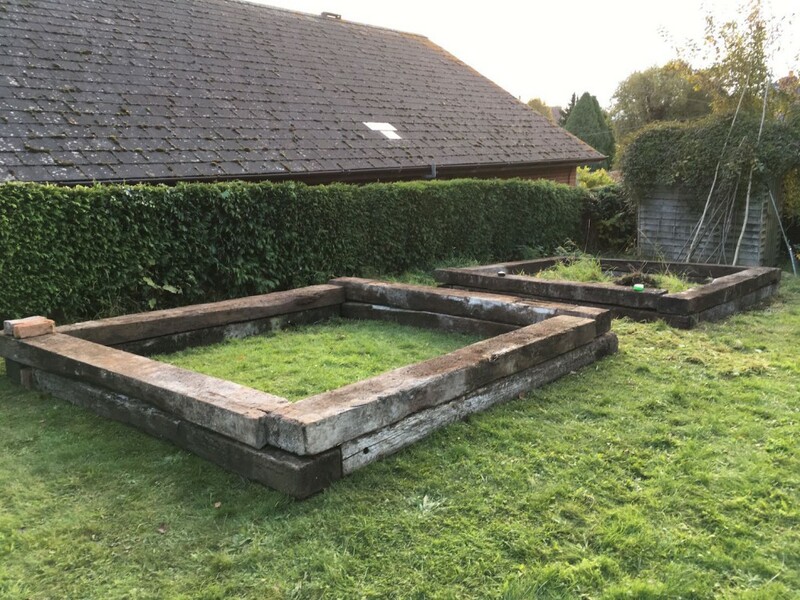 I’m going to line them with polythene so we don’t produce poisonous carrots and whatnot, then dig out all the grass and weeds, and fill ’em with topsoil and chicken poo. I’m also going to create a border around them, either of gravel or wood chippings, so the grass doesn’t get all mashed up and muddy. Next spring, we’ll be producing all manner of delicious goodies. and got Fish our joiner around to make a decision about the floor. 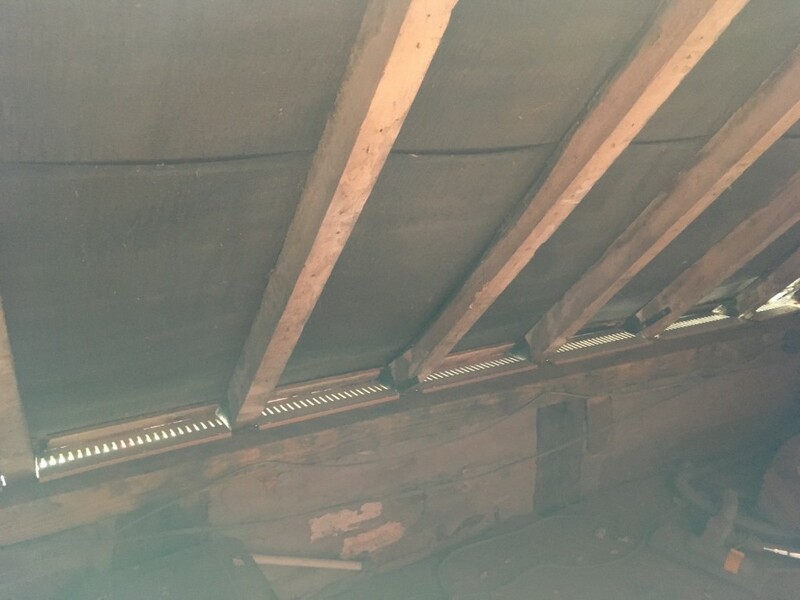 Take out the two beams supporting the attic floor. 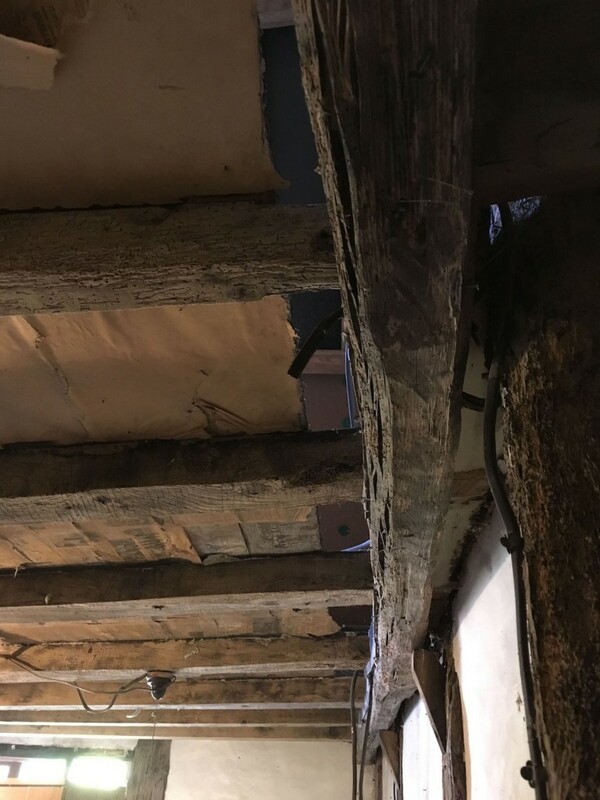 They were never meant to support a “proper” room, and according to the buildings guy who came round with Fish, were probably wall timbers supporting struts for lath and plaster before they became our ceiling. 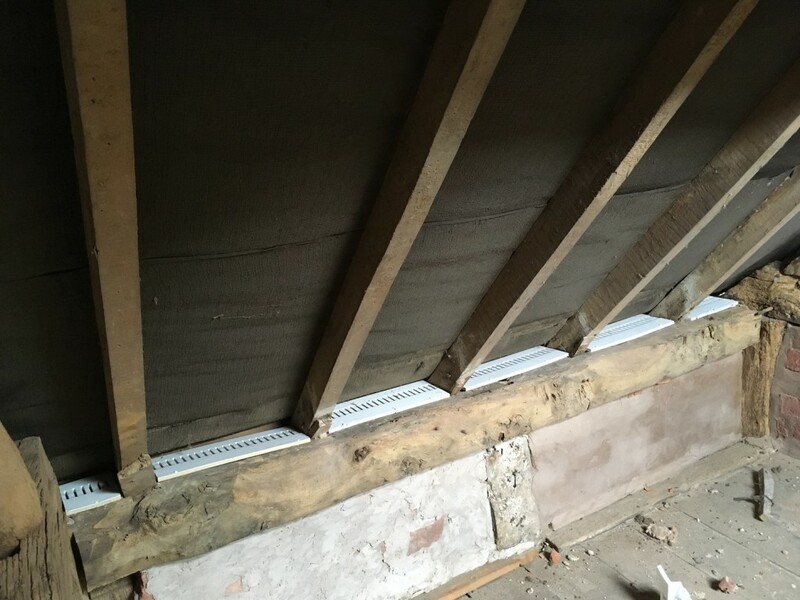 Install two 8in x 8in oak beams to support the floor. Knock out the “winking” panel so we can install said beams, and put in a new oak-frame window at the same time. 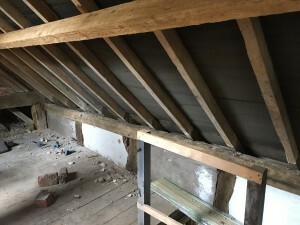 Maybe install new oak floor joists – the buildings guy said it’s not essential, but if it were his house he would do it. So we’re going to get a quote and see how much it’d add to the bill. We’d like to do it proper-like. Move the stairs. The new hand-made oak stairs were going to go in the same place as the old ones, but it makes more sense now we’ve opened up the space to have them go up from the corner, more or less where the downstairs stairs come up. So that’s all structural stuff we’ve to do, to make the building sound. All good, and it means we get a window into the Wonky Room so we’ll have more light. 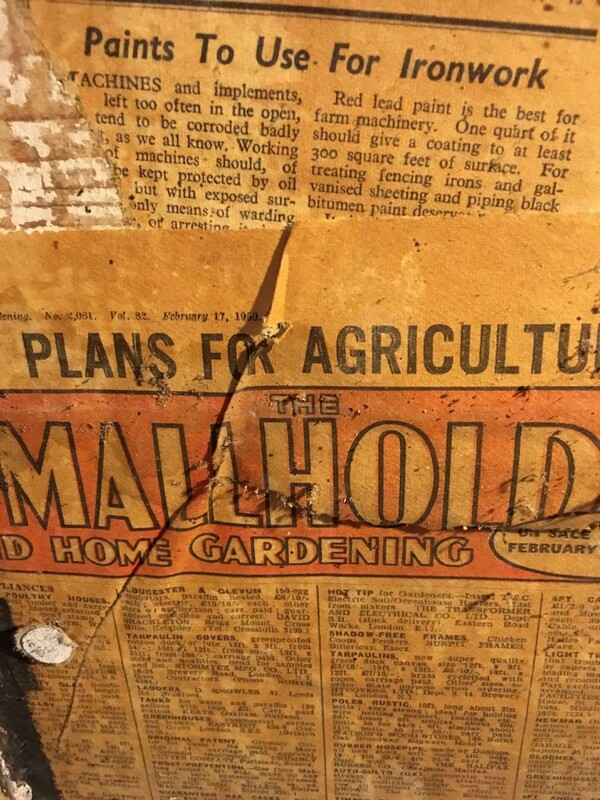 We really need to sit down with pen and paper and decide on the layout upstairs – and how it’s going to relate to downstairs when we build the new kitchen at the back. I’m going to save a couple of these panels, the ones in best condition, and varnish them and turn them into a little treasure. Same with some of the crazy wallpaper we’ve lost with the stud walls. I’d like to keep a little reminder of what was here before us. We’re leaving this timber in place. Partly because it’s so wonky I don’t know how we’d replace it. It’s aces. But mostly because when you jump up and down on it, it barely moves. We’re going to replace those supports with something beautiful though. We had a quote today from a lime plastering expert, and it looks like we can get the attic plastered before Christmas which will be brilliant. 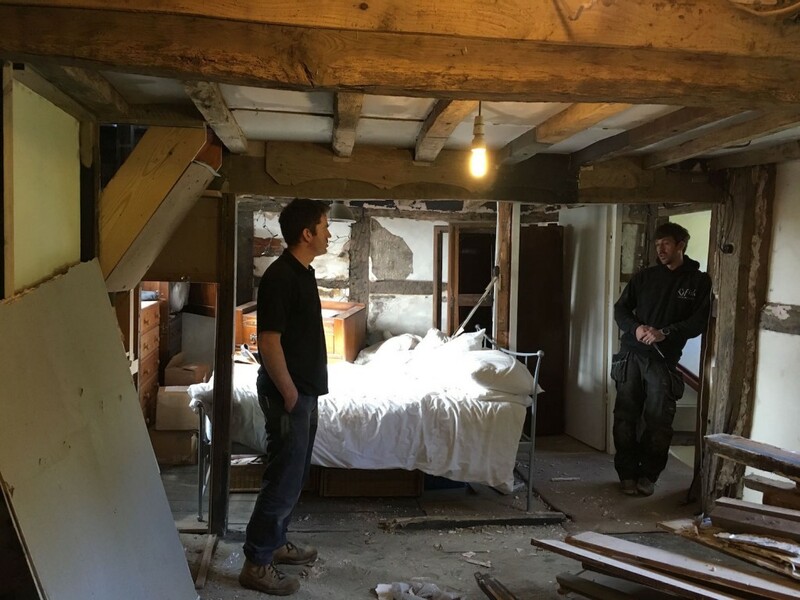 He’s solved the freezing wall problem – there’s some insulating lime plaster that gives you a “pillow” effect, so we can expose the timbers but still keep some of the chill off the wall. 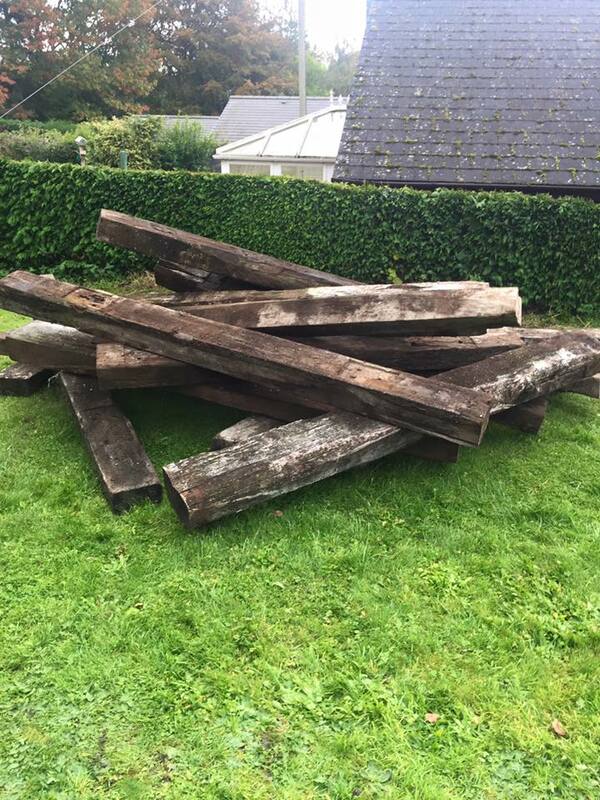 Looks like we’re looking at about £50 a square metre, which seems pretty standard from what I can find out. The rules with an old house seem to be: Gypsum is bad. Plasterboard is bad. Modern vapourproof insulation is bad. None of that celotex or kingspan stuff. It all adds to moisture imperviousness, and these old houses need to breathe. 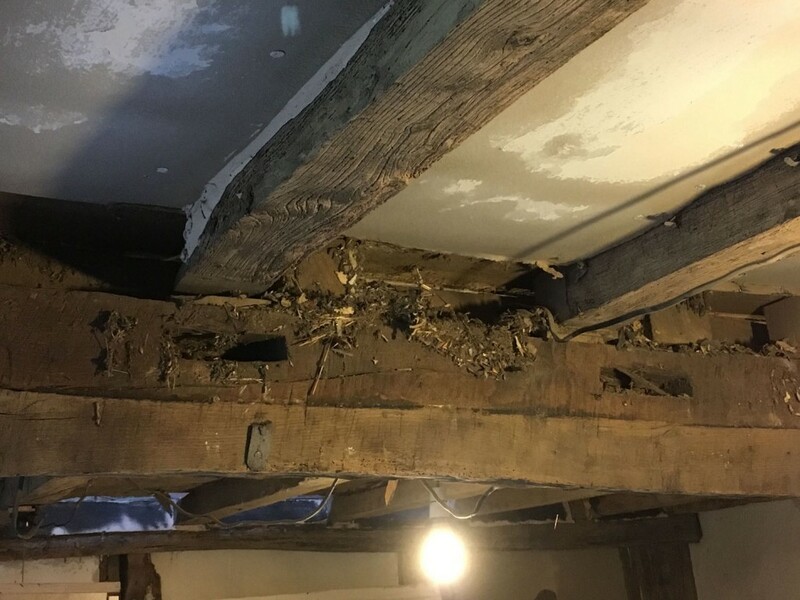 If you don’t let the moisture out, your timbers rot. 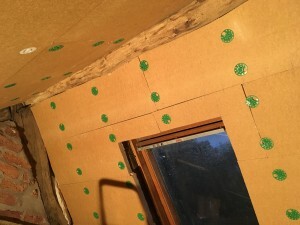 We needed to create walls and insulate the space up in the loft, so we bought a boatload of this stuff – woodfibre board. It came on a pallet, it’s light, dusty, fits up the stairs into the loft, and was pretty easy to cut and fit. 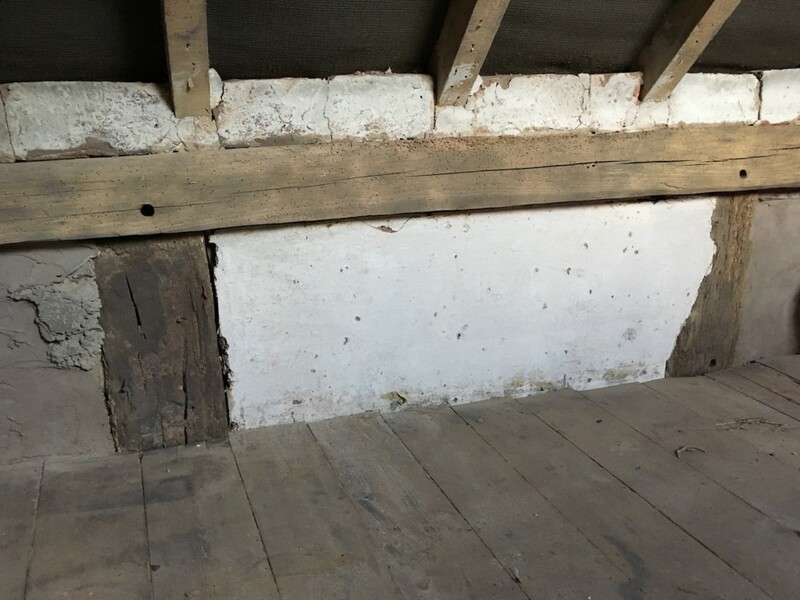 After a few hours of working with it, I think we got pretty good at fanangling it into corners and around tricky wonky beams and whatnot. We’re quite pleased with that. The really annoying bit is that we ran out of those fancy plastic washers that stop the screwheads pulling through the material, leaving the job unfinished.. That bit on the left on the next image- it’ll have to wait for next weekend. Once that’s finished, we get it lime plastered and that’s that. Nice warm breathable walls. And no squirrels. But we did go to Kent’s in Hereford because Ronnie the builder from the pub told us it was the place to go for soffits. Having no idea about these things, I figured we’d probably be shelling out a couple of hundred quid and it’d be a bit of a ballache fitting the things, because of drilling holes and putting vents in and that. 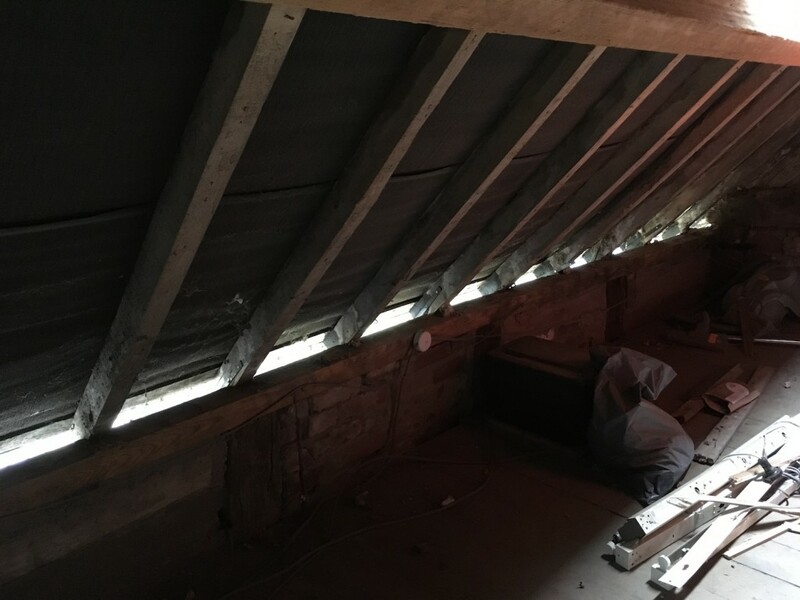 But on arrival, the helpful young man pointed out soffits with vents already within them – and we got 15 metres of the stuff, cut up small enough to fit in our car, plus a box of pins to fix them. They’re not going to be visible at all, so we didn’t have to worry about what they looked like. And they’re not really true soffits anyway, they’re simply there to ensure no critters get into the cavity behind the rafters and set up shop there. 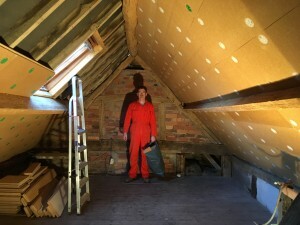 After a sustaining meal of boiled eggs and soldiers and a cuppa, we dragged everything up into the attic and got started. Fitting the soffits was actually really simple, and only took us a couple of hours. We got a system going: Joe would measure all the distances between the rafters. I’d saw the soffit into the right lengths. Joe would nail them onto the timber. A job well done. Not authentic, perhaps… but we’re beginning to realise that if we do everything exactly as it “should” be done, we’ll need a bottomless pit of money. So we’re concentrating on doing the best for the house – making sure it can breathe, making it as authentic as possible – but not bankrupting ourselves or driving ourselves crazy in the process. We do have to chip out all the concrete that’s in contact with the timbers, though, because it rots the wood. Not breathable, see. So that’ll be a fun job over the next few weekends. We’re pleased with our progress today. 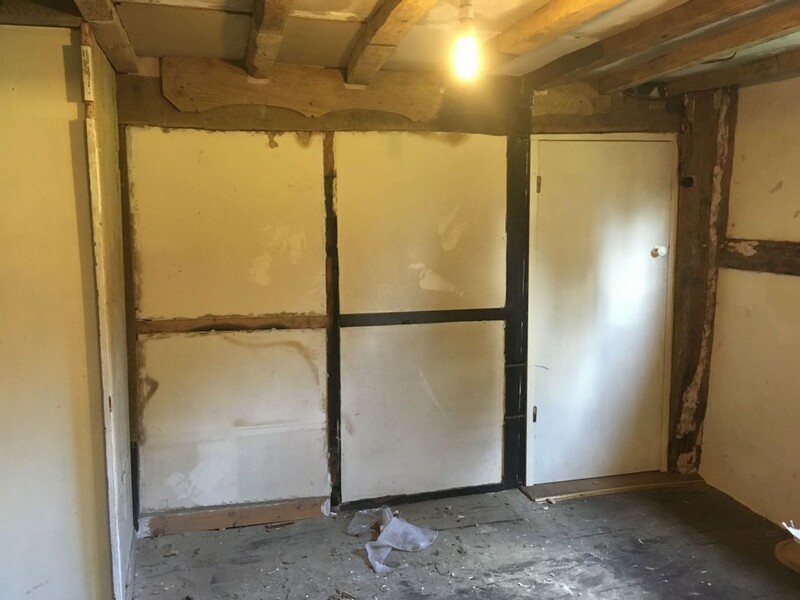 Tomorrow (Sunday) we’ll be starting to fit the breathable, eco-friendly, insulated plasterboard.